This is a sponsored post written by me for American Sign Letters. All opinions are mine alone. I love being an entrepreneur and working from home. 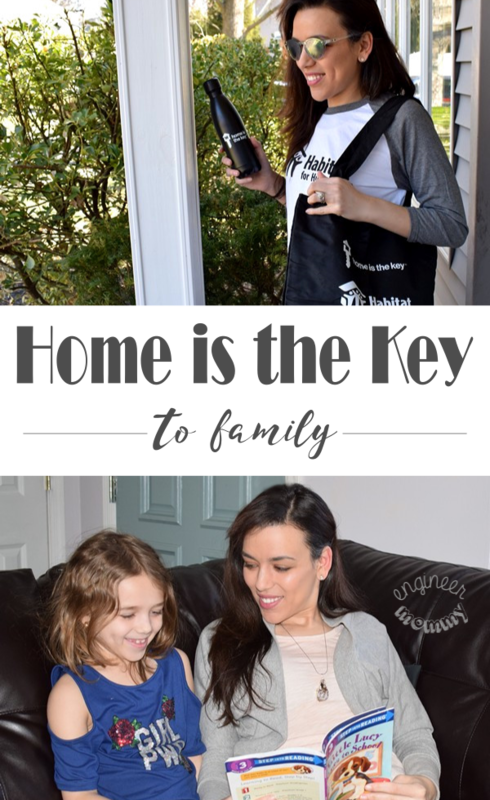 As a busy mom of two kids, having a flexible schedule is a definite perk. While I occasionally head to a local coffee shop or work on our patio, I often spend hours in my home office. Today’s post will include plenty of actionable tips on designing a practical, attractive work space. 1. Pick the right location! Don’t set up your home office in a busy, crowded or dark space in your home. If the area is not inviting, you will not be inspired to work in the area. Find a location that is bright, airy and aesthetically pleasing to you. In our home, I picked the 3-season sun room as my home office. It features windows on three walls so the room is always bright and sunny – a definite bonus for a blogger that takes pictures every day! I am a big believer in incorporating inspirational quotes in the home office. I’m really loving all the Wall Quotes from American Sign Letters. 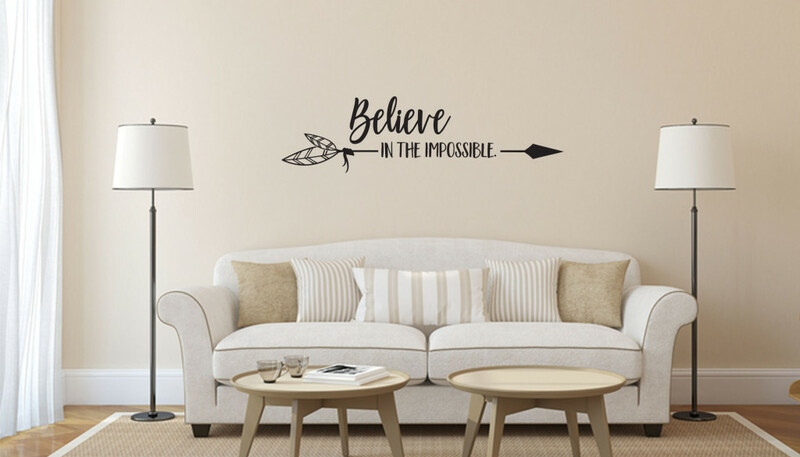 The quote “Believe in the Impossible” is perfectly fitting for a home office – it would totally inspire me to work harder and boost productivity. If wall quotes are not your preference, you can also check out Sign Letters, Printed Signs, LED / Neon Signs and more at AmericanSignLetters. The site actually guarantees the best prices on sign letters & offers free shipping every day. If you’re working from home on a semi-regular basis, having a comfortable workstation is essential. Invest in a high-quality chair that is ergonomically appropriate. Add a lumbar pillow to your lower back for extra support, if necessary. Also, ensure that your monitor and keyboard are positioned at optimal heights for your viewing comfort. 4. Get gorgeous business cards! Every entrepreneur needs business cards to showcase their company – and bloggers are no different. In fact, this year, I am planning on getting some fancy new business cards. I am totally crushing on the Magnetic Business Cards from AmericanSignLetters. You can submit custom artwork for the business card online via their convenient form. I love that the full-color business cards come with professional-grade magnets. They are prepared & shipped within 3-5 days so the turnaround time is totally reasonable. You can choose square corners or, for an extra fee, rounded corners. And as usual with bulk orders, the more cards you order, the less you’ll pay for each one. To keep all your work-related gear neat and tidy, be sure to set up organizational systems in your home office. I set up this stack of closed boxes and labeled them with some of the items I use on a regular basis: hardware, stencils, & sewing supplies. I love that the boxes all have lids, since closed storage tends to look neater than open storage. I also love that I can stack them up, so I can take advantage of the vertical space in this area. 6. Hang a professional sign! If you work in a business where you see clients at your home office, this tip is a must-do! However, even if you never see clients in your home office, consider adding a professional sign with your business name on it. It will totally take your office from ho-hum to wow-worthy! I am really loving all the acrylic signs & acrylic letters at AmericanSignLetters. I love that these signs come with a lifetime guarantee against fading or chipping. There are over 100 different styles to choose from with limitless customization options. 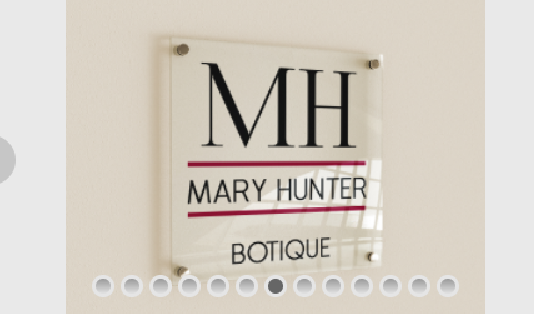 The signs are totally professional-looking with clear or frosted acrylic, laser-cut edges and 1/4″ thickness. These signs are suitable for indoor or outdoor use. You can purchase just the acrylic sign or add the standoffs for a more 3-D look. By the way, these signs are so gorgeous and so affordable that they can be used for other purposes (seating charts, table numbers, birthday parties & more). A home office wouldn’t be a home office without a computer, am I right? However, don’t let technology – and all that comes with it – get in the way of your style. You can’t necessarily make your computer look pretty but you can surely conceal all those dangling cords. Keep your equipment close to outlets and use a cable organizer to corral all cords inside a white plastic casing. 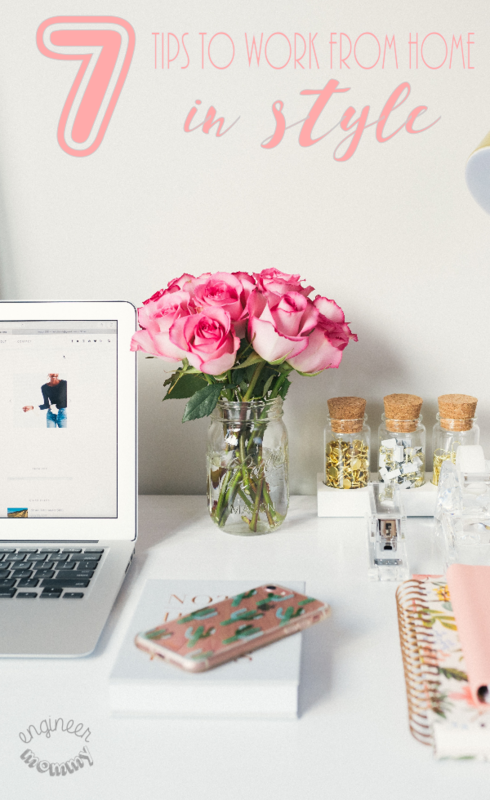 I hope these tips have inspired you to spruce up your home office. If you’re looking for ways to add some professional pizzazz to your space, don’t forget to check out AmericanSignLetters. They offer a wide variety of custom sign letters at affordable prices. Whether you’re looking for letters that are metal, plastic, vinyl, or made of another material, be sure to get in touch with them. Within 24 hours of submitting a form via their website, they are usually able to provide a custom quote for your project. Their staff is also available via phone, email or chat to answer questions about your sign & ensure you have a wonderful shopping experience. To stay updated on the latest news & offers from the company, check them out on Facebook, Twitter, Pinterest and Instagram. What does your home office look like? Would you love a professional-looking sign on your wall? What is your best tip for a fabulous home office? My home office is a shambles. It’s organized but I don’t put things away, all the furniture is hand me downs and mismatched. It needs a complete and total shake down! In the meantime, though, I’ll follow your advice for a better overall look. Pick one room or corner and make it the work space. Keep everything there and not spread out. Set timer for breaks and close the door. Yes, I love these tips. I work from home, and I wish I had a home office, but there’s no room. Instead I tend to do most of my work on the living room couch, but I’m comfortable! Love your tips! 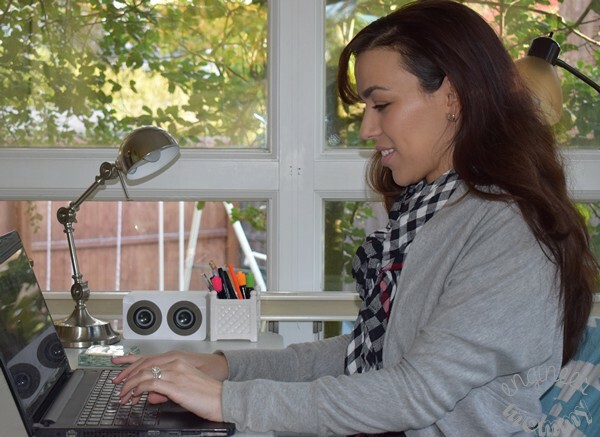 I agree that ensuring that you have the right location for your home office will really play a major role with working from home. My home office is my official she cave. It’s decorated just how I want it. It gets lots of light and it’s gorgeous. I’m working on adding art to the walls now. Yes, I have kinda made the office my she-cave too! It’s my space and I have made it feel very special to me! Love this! I’ve been a work-from-home mom for … oh wow, 12 years! It goes by fast. A lot of your tips are very key, especially finding the right place to work. Over the years with kids I’ve had less and less choice about it, but you do what you gotta do to get stuff done! Having a home office really requires proper scheduling and also discipline on committing to a work time table. It’s also important you set your own work area and make it as comfortable as possible. I have a tiny stand up desk. That’s really all I need to be able to work from home. I hate sitting and only let myself sit after like 5pm (works done? lol)… But seriously, I stand because it’s great for my back! I used to sit in front of my computer all the live-long day and I had major back pain. NOT SO anymore! A standing desk is smart. I have one that I use only occasionally. I should use it more often!! I try to keep my desk very neat. I have decorations hung up above my head so that I can enjoy stuff that my kiddo makes. I like some of the suggestions you have here. I think I do try a few myself. My office space is rather lame. I use a laptop to work and usually work where ever it is comfortable since I have multiple health problems. I wish I had a home office. We don’t have room for one so I make do with a corner of the living room, I actually like being able to keep an eye out on what’s happening in the house. I have a great home office and very comfortable and well lit up most days which always helps you work. I love your tips and I have to get rid of some of my clutter and organize a little better. These are all such great tips. I think if you make a space that looks and feels like a workspace, it’s easier to really feel like you’re working. I love the business sign idea! When I started working at home it was tough to focus because I was working on the bed. I slowly set up an office space and was the best decision ever. I was more productive and more focused. I think these are wonderful tips! That’s so true! I dislike dark place, like my home office right now. My husband and I aare thinking to remodel our house, so we can get more sunlight. These are really fabulous tips for a home office. I am starting to try to put together some stuff for my office so this is totally helpful. Me and my husband share an office at home. I try to keep my area as neat and organized as possible, but of course, his stuff finds its way into my area. I think I will need to get more storage bins to save my sanity! I love all these amazing ideas for your home office. My office is in transition now and I am currently working on our breakfast island :(. I will check out what goodies and inspiration American Sign letters have. Ohh, I love the idea of hanging a professional sign on my working area. Now, I am thinking of what design to put on it. Nice idea dear, thanks for this!